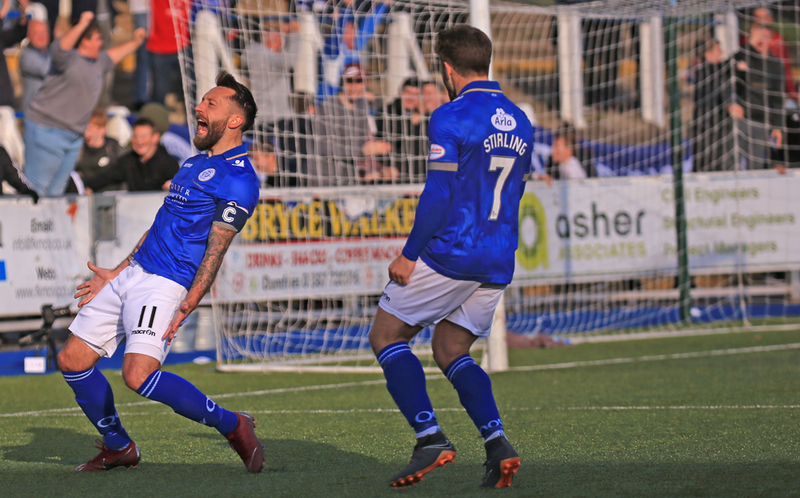 The visit of Alloa to Palmerston on Saturday is the start of a big week for us, with our visit to Morton on Tuesday and then to Dunfermline next weekend, it's the first of three games in the space of seven days. Alloa are the only part-time team in the division and although they sit bottom of the table, they are still well in the mix. Our two games against them this season haven't gone the way we would have liked. They raced into a three goal lead on thier last visit to Dumfries before Stephen Dobbie's hat-trick rescued a point for us and Jim Goodwin's side got the better of us, two - nil in our last meeting. With our results taking a dip in recent games, manager Gary Naysmith is looking to get back on track. "Last weekend's game was a very frustrating one for us. I thought the lads did ever so well, especially when we went down to ten-men and we deserved to get something from the game. One mistake cost us, it's as simple as that. I had no complaints whatsoever about the decision to send Barry off, but I was annoyed at the sloppy way we got ourselves into the situation that led to the penalty and the players are learning that, at this level, errors tend to be punished. Actually, when you look at the game against Dundee United we had Scott Mercer on the sidelines for more than five minutes getting stitches so when you add that to the sending off, we had eleven players on the pitch for just 33 minutes although I couldn't have asked for more from the boys who were out there. However we are now approaching the business end of the season and from here on in, it's all about results. We have lost three consecutive league matches for the first time since I arrived at the club and I can assure you that it's not a nice feeling. Thankfully, in terms of league position, other results went okay for us and we remain three points off the play-offs. In all honesty, it looks as though third place may just be beyond our reach now but the rest of the division is still so compact. There are ten points between fourth position and the bottom of the table, which means that as we approach the end of February, every team has something to play for. This is the start of a big week for us with nine points at stake. I will be thinking a lot about how to maximise the squad of players at my disposal but suffice to say that each and every one of them knows how big a seven days this is for our season. Alloa Athletic are a very well-organised team who play good football. They have caused us a lot of problems in the two games so far this season, so we know the scale of the task we face. But as I said at the beginning, our performance levels have been good, so if we can remain focused we can give ourselves a good chance. Barry Maguire's red card against United means he will be suspended for the visit of Alloa and we have injury doubts over three players but Fraser Aird who couldn't play against his parent club will be back in the squad". Section six of the BDS Digital (East) Stand has been set aside for visiting supporters. They should enter via turnstile three. The catering outlet and toilets in the BDS home side will be available for use. Catering is also available in the Arena café where a full menu is available before kick-off. The bar under the Gates Stand will also be open for refreshments. Entry is by ticket only. The Arena ticket office will be open from around 1130 with the BDS stand ticket office opening around 1pm. Please note that the BDS Stand ticket office is a CASH ONLY office. Should spectators wish to pay by card then they should purchase their tickets at the Arena ticket office. Spectators should arrive in plenty of time to ensure that they purchase their ticket and gain entry to the stadium for the kick off. Turnstiles open for admission at quarter past two. Wheelchair access for away supporters is on the south side of BDS Digital stand. There is a layby on King Street for vehicles to drop their passengers for flat access to the ground. Disabled parking is available on the north side of the BDS Digital Stand or at the Arena car park. The cost of entry of one personal assistant is included in the price of the accessible ticket. It is suggested that buses/minibuses drop off their passengers in Terregles St/King Street and thereafter park on College Mains road just off the roundabout with the A76 on the town bypass (adjacent to Curry's/PC World, as the other side at Aldi is the access road to the ambulance depot and is extremely busy). Pick up should be the same location. There will be parking restrictions in operation, but car parking is available in the Arena car park, alternatively there is plenty of other on & off street parking available around the stadium. We are not aware of any roadworks around Dumfries that would affect travel times to Palmerston Park however fans should check the Traffic Scotland website at http://trafficscotland.org/index.aspxfor confirmation and of any other delays. QOS have adopted a robust and thorough search policy for spectators entering the ground to ensure that ground rules and regulations are strictly adhered to, especially in relation to pyrotechnic devices and controlled containers. All bags will be searched and spectators presenting themselves for entry may also be subject to search. Palmerston Park is a non-smoking venue, this includes e-cigarettes and other such devices. Stewards are empowered to eject spectators who disobey these rules. No persons will be admitted to the ground who are deemed to be under the influence of alcohol. All spectators are required to abide by our good behavior policy. Our Saturday Kids club will take place for Primary School kids in the Arena from half past 12. Always great value. While the hospitality box is likely to be full of glamour as the club hosts its annual ladies day. And Caleb Cook will be our mascot for the game that kicks off at 3pm on Saturday.